Most of the commonly cultivated varieties of strawberry plants (Fragaria x ananassa) will produce “runners” as a means of propagating themselves. Anyone who grows strawberries is probably familiar with the term and, at some point, probably experienced at least a twinge of curiosity regarding them. You may have even asked yourself, “Exactly what are strawberry runners ?” Be curious no longer, for you are about to find out! Strawberry runners are properly called “stolons.” The word “stolon” comes from the Latin word “stolō” meaning a shoot, branch, or twig springing from the root. Stolons are produced by virtually all June-bearing strawberry plants and most everbearing and day-neutral strawberry varieties. By definition, stolons are horizontal connections between organisms, and they can arise from the organism or its skeleton. Animal stolons are usually formed from exoskeletons, and are outside the scope of a post about strawberry plant runners. Most plants have a root system that consists of a primary root or primary roots with root branches forming and growing from the primary root. Strawberry plants have this arrangement for the majority of their root system. However, they also have a special advantage: adventitious root formation at the nodes of their stolons. Adventitious roots manifest away from the primary roots of a plant, originating instead from the stem, branches, leaves, or old and woody roots. As the name implies, this gives certain plants somewhat of an advantage over other plants. In the case of strawberry plants, they are able to propagate themselves laterally in different directions via runners to find more suitable growing locations for their clone offspring. This allows them to find better soil or areas of better sunlight. As the strawberry plant runners are sent out, the nodes will develop the adventitious roots, sent them downward, and establish the new clone plant once contact with soil is made. Once established, the intermodal runners will dry, shrivel, turn brown, and eventually separate leaving two independent plants: the original and the clone. These special roots make it easy to start growing strawberry plants from a runner. For the gardener or farmer, strawberry runners can offer significant benefits. For perennial strawberry beds, matted rows that will produce bumper crops of strawberries can be established (see the Growing Strawberries page for additional details) using only a few purchased or transplanted mother plants. This saves money as well as time (the farmer has to plant few plants!). If planted in ideal conditions with regulated and appropriate amounts of water applied, most strawberry plants will produce abundant numbers of runner plants. Under ideal conditions it is not uncommon for a single plant to produce between 30 and 50 runners, depending on the vigor and qualities of the variety. For nurseries or commercial operations, the constant production of new strawberry plants yields a return on the initial investment as the new clones are sold. A nursery or gardener can also make use of the adventitious roots. Since the strawberry plant runners are fairly flexible, the nodes can be positioned above pots, plug trays, or other growing medium. Once the root touches the soil, it will grow right where placed. Once established, the new clone plant can be separated from the mother plant and carried off in its new container, pot, or plug tray. This makes them easy to transport, sell, or re-plant elsewhere to establish a new strawberry patch. All is not rosy in strawberry runner world, however. There are a few drawbacks to the production of strawberry plant stolons. The strawberry plants don’t understand the desires of a gardener. They only want to eat, grow, and reproduce. As such, they don’t stop sending out runners when you would like them to do so. Because of this, strawberry beds have to be thinned and renovated in order to maintain maximal production and vigor. The prolific runner production of many of the different Strawberry Varieties also makes them somewhat invasive. Without having a dedicated area for growing strawberry plants, many cultivars will take over a garden and can choke out other plants. Runners facilitate this lateral, invasive spread. Additionally, it takes productive energy for a strawberry plant to send out runners. The propagating energy used up in stolon production does not go into production of strawberries. Since most people grow strawberry plants for the strawberries and not the runners, it may be necessary to prune the runners so that more productive capacity is manifested in more and bigger fruits. As with most things, there are positives and negatives when it comes to the runners on a strawberry plant. Should they stay and grow, or should you prune them? There is no answer that is correct for every situation. 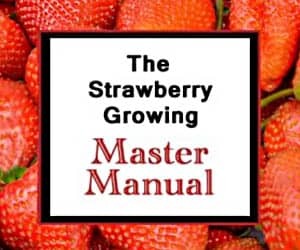 But, hopefully, you understand strawberry runners well enough now to make an informed decision that will be best for your specific cultivar and your garden! A few of my mother plants have leaf blight, and a few others have leaf spot. I will be getting rid of them and starting a new strawberry one all together, but what about the attached runners? They do not appear to be diseased, but I still think I should get rid of them as well. Thoughts? what fertilizer can make a strawberry produce more runners? I have beem growing strawberry plants for about 6 years now. I havr my one original bed that strawberry runners took over spreading out and I moved to a few plants to another bed. Most runners did not survive. However, the run tuff plant sent out too many runners. Noe I have like 7 rows of strawberry plants. It is only May and I already have runners sending out with many numerous unripened green strawberries. I will already have to start cutting runners before my berries ripen. This happened after i had snipped yellowish and brown leaves to provide better aeration at the bottom. My strawberry plants grew a new plant/new crown beside it with no intermodal runners aka stems. What is this called and should I/ can I seperate them. I bought them from home depo last year and they dont tell you what kind of strawberries your buying, but it’s one of or the only place to get strawberries in the Virgin Islands. The fruits are kinda small and tart but yummy. Try this method. Good luck! Hi, our strawberry plants are very healthy and are sending out runners, however many of them are turning brown and dying at the tip before leaves really form. What would the cause of this be? If you have rabbits or other furry critters, they could be damaging them. Also, some nutrient deficiencies in the soil can lead to this. Have you had your soil tested? If you haven’t, you might want to consider starting there. Good luck! I’m from the Philippines, i plated my strawberries 3 months ago, i wanted them to produce runners, however my plants keep on giving me fruits but no runners which i wanted so i can plant more. Is there a way to induce my strawberries to produce runners? I’d just give them a few more weeks. The plants will likely start producing runners toward the end of the harvest. Good luck! Hi. Do the runners jave to be in soil to produce new flowets/fruit off the runners. I was thinking of trying to vertically trail the runners. I have a rabbit so everything in my garden has to be high up. Runner plants should be rooted. Vertically trailing the runners won’t be successful in the long run if the nodes aren’t connected to soil/a nutrient source. Good luck! Had a friend give me strawberry runners and I don’t have my bed ready. How do I store the runners until I’m ready. Thanks! If they are in soil, just keep them watered. If they are bare-root, see this. Good luck! Hi, do you need to wait the runners to start growing adventitious roots before hooking them up in place? Mine’s not growing any. And do additional plantlets grow from a single runner that produced more than one node? No, as soon as the leaflets sprout from the runner, you can affix the bottom of that spot to the soil, and it will root there eventually. Yes, if a runner has more than one node, an individual plant will grow at each node. Good luck! Hi, I have plants growing on plastic mulch, through a hole about 5cm in diameter. The plant has filled the entire opening. It is still fruiting ( new plants about 8 months old ) We would like to obtain stolons from these plants. Do the openings need to be widened to allow the plants to grow more leaves? There are lots of bugs under the plants that fly off when disturbed. DO you know what they are? As long as the crown is visible through the hole, the runners should be able to exit. You will need to watch them, however, and provide a pot for the new daughter plant’s roots. Otherwise, the new plant won’t be able to root into the plastic and will die eventually. I am not sure what type of bugs the ones you mention are. If they aren’t feeding on the plants or berries, they shouldn’t be an issue for the strawberry plants. Good luck! Do the plants need a specific age for them to grow runners? And do the plants stop sending runners after they get old? Yes, very young plants won’t produce runners. Typically, strawberry plants will produce runners after they are finished (or mostly finished) producing strawberries. As the plants have to be vigorous to produce runners, they will slow down and eventually stop producing runners as they age. Good luck! I bought a strawberry plant with flowers and fruits already formed. But there are not even a single runner being sent. Is it because it’s hard for me to identify the runners or it’s still too early for them to send runners? The strawberry plants usually send out runners after the strawberry harvest is complete. Give them a few weeks, and they will likely start producing runners for you. Good luck! Do the strawberry plants need some specific pot size for the plants to send runners? I plant them in a pot and is producing flowers and fruits, but no runners were send. I’m not like other gardeners, though. I like runners more than the fruits since I’m not eating the strawberries, but my family does. Not usually. After the strawberry plants have established themselves well enough to support a daughter plant, they will usually put out runners. Sometimes you have to be patient, though. Good luck! My strawberries are in their second season. I had a fabulous crop of June-bearing berries this spring, from late April clear through the middle of June. But I have yet to see hardly any runners. My plants are in a large cattle-watering tank, with gravel in the bottom and dirt on top. It was an ideal height for picking, and the tank is now loaded with plants. I just can’t figure out why they aren’t sending out runners. Give them a little more time, and they probably will send out at least a few runners. Good luck! does strawberry runner child plants supplying the photosyntesis sugar to the mother plant too? or it basicly more like parasite to the mother plant instead of supporting the whole growing system both side through the stele? The runner plants are basically parasitic until they root and can support themselves. That is why clipping the stolon prior to the new plant establishing itself will result in the death of the new plant. Good luck! I am on my second year with my plants(everbearing). I have beautiful plants, but they are not producing any flowers. I have been cutting back the runners in hopes that that will help. No flowers. I have not been fertilizing except at the beginning of the season. In the early spring I transplanted them all with good compost also, so I know it is good soil. I keep them consistanly moist and not wet. Is there something I can add to my plants that will encourage the plants to flower? I am at a loss here! Thank you for any advice you can give me! If the plants were planted last year, you should be getting berries. It is possible that, for some reason, the perrenating buds that are supposed to form didn’t form last fall. If that is the case and you do have everbearing varieties planted, you can still get a harvest toward the end of the summer or early fall. So, keep snipping unnecessary runners, and hope for the late harvest to be as big as possible! Good luck! I planted my strawberry patch three years ago. The mother plant every year has produced fruit but not very big berries. My wife got the plants from her mother who has had theses plants for forever. She said that they always produced big fruit(I can say that they do cause I have seen what her mom’s do). The other thing is there are very few runners any thought. If the plants are old, they won’t produce well. Also, if they are too crowded, don’t have good soil, don’t get watered appropriately, or don’t get enough sunlight, they will also produce poorly. Pathogen and pest infestations can also cause diminished production. I’d recommend reviewing this information. Good luck!